Is an excellent anchorage in most if not all conditions and is protected by huge limestone cliffs. Here we find Maya Bay made famous by the movie "The Beach". 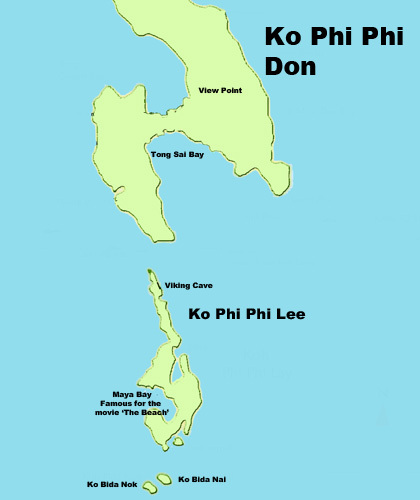 Phi Phi Lee lays 20 miles east of Phuket Island. Maya Bay is a picturesque bay with majestic limestone cliffs. Phi Phi Lee makes a pleasant stopover before Phi Phi Don. Unfortunately this place is during day time usually super crowded with speedboats. We prefere reaching this destination for overnight trips with a sailing yacht, so you can avoid the crowds. Facilities ashore include numerous restaurants catering for all tastes, low- key nightclubs and the mandatory clothes and souvenir shops. There are an abundance of activities to keep one occupied. It is a good place to have a traditional Thai Massage as well.One of the most pleasant walks in the area can be found here, to a lookout above the two bays, Tonsai Bay and Yongkasem Bay. 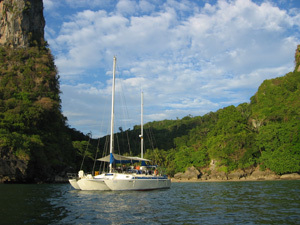 Phi Phi Island is too far for a sailing yacht from Phuket for a daytrip. 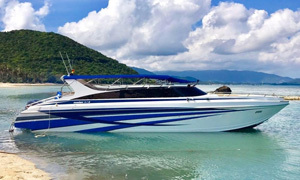 But you could rent your private Yacht for a longer overnight sailing holiday in Phuket Waters.